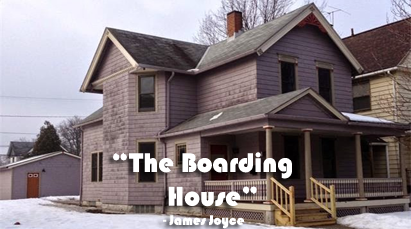 “The Boarding House” is a social story written by James Joyce. The writer deals with the experience of adolescence. The story is about an Irish middle class family living in Dublin. Mrs. Mooney, one of the main characters of the story, was a butcher’s daughter. She was very much confident and independent woman. She was married to her father’s foreman (helper). After marriage she started a butcher’s shop which she ran successfully. But her husband was very stupid and drunkard. He drank all the time and finished most of the property. He fell into a heavy debt. He quarreled with his wife and sometimes attacked her with a cleaver. So she had to go to neighbor's house to sleep. Therefore she got divorced from her husband and opened a boarding house where many tourists, office workers, artists would come to stay. Mrs. Mooney had a son and a daughter. Her daughter, Polly Mooney was a beautiful girl of 19. She fell in love with Mr. Doran, one of the young boys living at the boarding house. Mrs. Mooney suspected their relation but kept quiet watching their activities. One day she asked Miss Polly about went to Mr. Doran’s room and informed him that her mother had known their secret relation. Mr. Doran fell in confusion not knowing what to do. In fact, he was not in mind of marrying Polly, she was not educated and her language was not good. She was the daughter of a butcher and her boarding house had no good fame. On the other hand, he was from gentle family and he had a good job. He thought that if he married her all his friends would laugh at him. Miss Polly began to weep but he asked her not to lose patience. At the same time maid (servant) came in his room and said that Mrs. Mooney wanted to talk to him. Wearing a coat he went to see her. Miss Polly sat alone in the room thinking about what he and her mother would make the decision. After sometime her mother called her and said that Mr. Doran wanted to speak to her. Thus, the story ends in suspense. We don’t know what decision has been made. However, we can say that Mr. Doran must have agreed to marry Miss Polly. Answer: Mrs. Mooney was much more confident that any woman who would act so much cunningly in such a crucial situation. She knew the course of action. She waited patiently. She was reminded of her own youth when Mrs. Mooney was trapped by her own father. But the marriage turned to be a tragic one after Polly's birth. Mr. Doran was already unsteady. He trembled as he entered the room. He bowed down and made some silent gestures of approval. He knew that he was going to be a victim. He thought that it would be shameful before all the friends. It would have been all right if he had been allowed to take her somewhere far away from the sight of his kith and kin. Mrs. Mooney in a very decent manner asked him all about their relationship. He answered like a guilty criminal. He okayed to marry Miss Polly and agreed to spend with her the rest of his life. He also said that he could continue staying with the mother in the same boarding house. Mrs. Mooney smiled at seeing the innocent young man. Immediately, she asked the servant to call Polly. But the servant was not there. So she called her daughter to come to her for setting the affair. Class 12 Course "The Boarding House"
Answer Questions Of "The Boarding House"
Word Meanings In Nepali Of "The Boarding House"
Summary Of "The Boarding House"
Complete Solution Of "The The Boarding House"
0 Response to "The Boarding House | Summary | Word Meanings | Question Answers | Class 12"